We all have those albums and songs that signify a part of our childhood. For me, Jackyl’s self-titled 1992 debut is one of those benchmarks. Mind you, as a kid, most of the not-so-subtle innuendo didn’t really mean anything. It was just fun, catchy rock music that should be played as loud as possible. When adult me found out Jackyl was going to be at Club LA on January 28th, it was downright necessary to go. It is hard to know if a band like Jackyl will rise to lingering childhood expectations, but boy did they. Playing through a slew of their greatest hits the band was there to have a good time and make sure everyone in the audience was too. For those that aren’t familiar with Jackyl, they are kind of the south’s answer to AC/DC; loud, fun, and a bit blue when it comes to their lyrics. 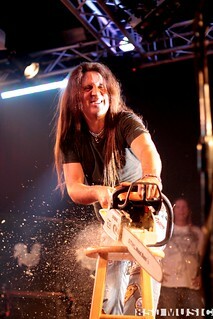 However the thing that the band is most well known for is chainsaw wielding lead singer Jesse James Dupree. I wondered if Dupree would be tired of the schtick, but he looked like a gleeful kid on Christmas as he destroyed a wooden bar stool on stage. See more photos of the night here. To learn about upcoming shows at Club LA visit http://www.rockdestin.com/. This entry was posted on February 15, 2013 by 850music in Posts and tagged review.